Story ideas do not come in a box of Cracker Jack…or can they? When I was a kid, the box of molasses-flavored popcorn-nut mix contained cool toys. It was a delight to pull out some plastic blue ring, too small for any human hand, and squeeze it halfway onto my pinkie finger and imagine it was…anything. It was a secret decoder ring, and only I had the clues to save the world from the alien spaceship about to destroy humans. Or the ring gave me super powers, and I would defeat villains by zapping them with my ring from atop flying horses. I was boundless. These days, the prizes are downright boring and cheesy if you ask me, but you can still take those cartoon baseball stickers or temporary dragon tattoos and write with abandon. How? Good question. The all-powerful “They” say to choose a situation, emotion or object and launch from there. Stories come from within so just start writing. Yeah, that’s easier said than done. Finding that starting point can be challenging. I dislike catchphrase advice because without specific examples, I don’t know how to apply those general tips to my writing. Two tips that annoy me are the seemingly useless “look around you” or “write what you know” how-to suggestions. Those phrases are cliché until I learned how to make those work specifically for me. There really is something to the generic advice to “look around you” for ideas. Consider this: It’s Chinese takeout night, and when you get to dessert, you remember the classic fortune cookie joke-fortune, “Help! I’m a prisoner in a Chinese fortune cookie factory.” That sentence alone opens countless opportunities. If you write romance, imagine the hero sweeping in and rescuing the trapped maiden only to be chased by her vengeful lover who locked her away in the factory in the first place. For the science fiction fans, is the prisoner actually an alien waiting to capture humans? If you’re geared towards mysteries or thrillers, what does the hero encounter as he or she enters the factory only to discover that the true purpose of the factory is…? Expand from that plot sentence and “write what you know” to develop characters. What charming habits do you have that your alien can have to humanize it? What annoying phrases does your aunt say that could provide tension between the hero and your damsel in distress? Does your friend have a nervous tic that could distinguish your sleuth? Could your spouse’s nickname be the name of a Young Adult character? If your character’s favorite food is Cracker Jack, the same as yours, does this vice affect the story’s outcome? Suddenly, writing is fun again. If you feel that your life has not been exciting to this point, then start now. Take advantage of where you are right now. “Look around you” and study people at the mall, the dog park, the grocery store or wherever you hang out. Imagine their stories. As a wanna-be coffee shop hipster, I hear random snippets of conversation that are fascinating story fodder. Always carry a journal, napkin or phone notepad to record these moments. If you tell yourself “Oh, I’ll remember that later,” you probably won’t, at least not with the same flavor you had at that moment. This personal exploration of people and their traits feels natural for a creative non-fiction writer like me. I discovered that I can “write what I know” and tell my life story three different ways from three different perspectives: my relationship with my dad; my interactions with my mother; and episodes told from an outsider’s point of view. Talk about maximizing your material. I found more “write what you know” opportunities when a few months ago, I rediscovered folders full of high school and college essays, stories and poetry. I flipped through them and wondered, how did I ever earn a passing grade on that? What the *bleep* was I thinking when I wrote this crap? Shudder. However, reading these embarrassing scraps of paper more closely, I actually found some moments of brilliance and passages I can salvage. Really, I was that creative? Really, I was that creative. If you don’t have past material to repurpose, it is not cheating to borrow inspiration from tools designed to spur imagination. A quick search of “story ideas” yielded numerous phone apps: Lists for Writers; Storyteller; The Brainstormer; Story Seed Generator; Story Starters; and Flash Fiction Prompter. 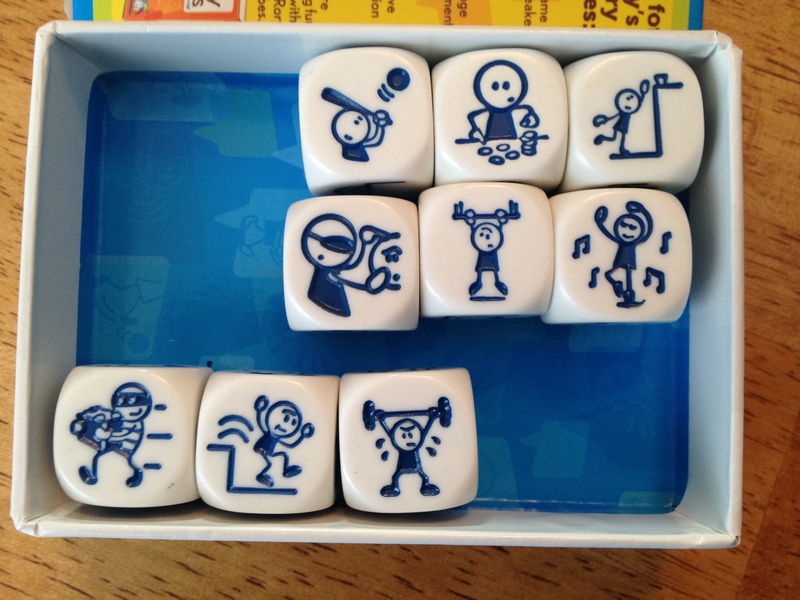 I have not used any of those products, but I did stumble upon the interactive game Story Cubes, which are themed picture dice sets. Rolling all dice in the Actions set generated an intriguing random assortment. Is that a story you would read? This came from the roll of the dice instead of a Cracker Jack box, but still…. Just think of what you can come up with when you look around and write what you know. Looking around, overhearing conversations, or tasting a foreign dish could trigger a story idea. Finding a unusual object or reading a different genre could also trigger story plots. Ideas can be gleaned from anything. We just can’t be intimidated into not trying to develop these ideas into stories. That’s a great opening line! These are very helpful ideas. Thanks for sharing! Thank you, Sue. Jimmy the Burglar is coming together as a fun project. Tim’s post above about “What If?” scenarios is perfect for me to use moving forward with that. As I pursue my writing, one regret I have is that I am just beginning to capture tidbits from the conversations going on around me. Many inspirational opportunities have been lost through years of inattention. I’m more determined than ever before to actively listen and write things down, whether it’s in a paper journal or electronic notes on my iPhone. Thanks for the ideas and encouragement. It’s never too late. Start where you’re at! You’ll be surprised with the past associations you’ll make. For on-the-go memory apps, I *highly* recommend Photo365 (picture a day) and Day One (journal with built-in time/temp/location tags). Fabulous and flexible!